After traveling for two weeks, Cam and Selena find themselves stranded in an underwhelming 2-star hotel near a train station in Hamburg, Germany. With no trains until morning, passions spark and a promise is made: to be intimate upon their future return to Hamburg, even if they have been with other people in the interim. 10 years later, that promise is tested when the two find themselves back in the same hotel room, searching for what they once had while trying to maintain who they had become. 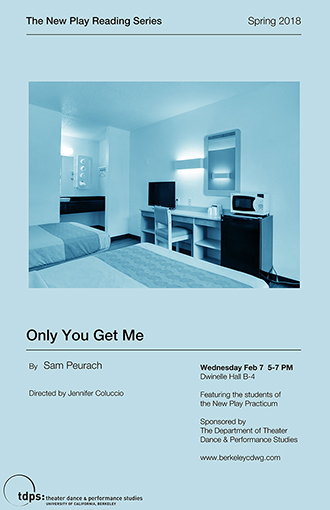 Join us for a reading of the play Only You Get Me by Berkeley alum Sam Peurach, followed by a discussion with the playwright and the director, Jennifer Coluccio. Presented by the Department of Theater, Dance, and Performance Studies. Sam Peurach is a recent graduate of UC Berkeley. He was a recipient of the Mark Goodman Award for Dramatic Excellence and the Theater, Dance, and Performance Studies Citation Award. He now lives back in his hometown of Los Angeles where, like many people, he is pursuing his acting career of being that one guy from that one show. "Only You Get Me" is Peurachs first full length play and he is honored to be able to go through this amazing experience of having it workshopped in his home department--where the writing first began. Jennifer McPherson Coluccio is a Ph.D. student in Performance Studies at the University of California, Berkeley. She was a theatre and film actor in New York and Los Angeles with credits that include In Justice, Entourage, Iron Man 3 and a five-year run in Tom Salamon and Neil Patrick Harriss live interactive series, Accomplice. She has been an acting instructor and director for a private Meisner conservatory, Excelsior College, and California State University, Los Angeles. The New Play Reading Series brings outstanding new and in-progress work by up-and-coming and established playwrights to the UC Berkeley campus. In the monthly New Play Reading Series, new plays are read by TDPS students, followed by a discussion with the playwright. This series is sponsored by the Townsend Center for the Humanities in conjunction with the Department of Theater, Dance and Performance Studies.